The smithy contains five main things to aid the blacksmith in their work. There needs to be a heat source or hearth to get the material red hot to be able to mould it. There must be a cooling system close to hand, not only for quenching material when it has been worked, but also as a safety aspect in case of embers rising/ or burning taking place while the blacksmith is working. Experience is critical to the skilled smith: skills still require practice. 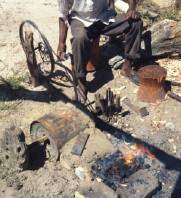 A form of heating hearth or forge is needed in which a fire can be maintained. Forced air will be required to assist in the generation of sufficient heat for workpieces to reach at least forging temperature, say 1000°C and preferably welding heat which is another 100/2000°C higher depending on the materials involved. The hearth can be formed by a stone or brick structure or a metal table structure. A hood or chimney is required when the hearth is indoors. Ideally, the hearth should be at least 2m (6′) deep and 2m (6′) wide. The hearth needs a strong stone slab or iron plate along the working ledge which should be a little lower than domestic table height from the ground, a tall smith would benefit from having this height increased still further so as to reduce fatigue. Traditionally bellows are used to supply air piped through the left hand side of the furnace, if the smith is right handed, through an iron tube. The heating medium can be charcoal if clean walnut-size gas coke is not available. If coke is used always screen it first by using a fine mesh riddle so as to separate coke dust and physical impurities, which may have become mixed with the fuel. Always keep the fire free from clinker: as soon as the essential heating area becomes too hot, clinker is formed and this needs carefully removing with the aid of a poker without losing the fire altogether. Most smiths-suspend a coke guard over the arch of the hearth, which also helps to improve natural draught slightly. The water trough – As mentioned earlier it is important to have a bucket or trough close at hand not only for quenching but also in case of burning. So the main use for the water is to quench the hot steel to cool or temper it. The bucket should be large enough to totally immerse all pieces of work easily. The volume of the trough should be at least 25 liters (5 Gallons UK) so this is possible. The container holding the oil should be situated in a separate place, either outside or somewhere else in the smithy. It should not be situated by any other combustible objects. 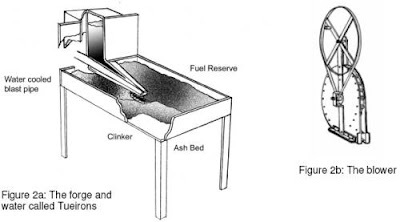 It is important to note that the forge and oil container should both be surrounded by metal flooring, not wood, in case hot coals are dropped or flash fires occur.